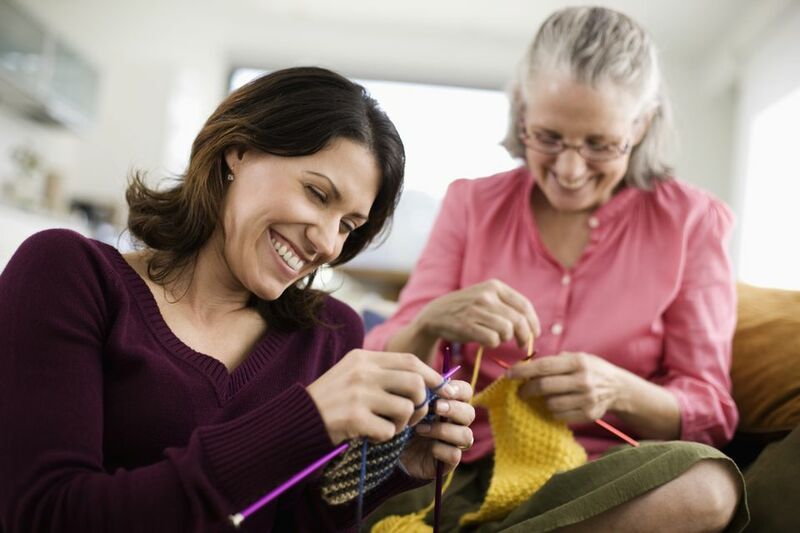 It seems like everyone at one point, or another will have the opportunity to teach someone how to knit, whether it’s a friend, family member, church group, or online. If someone has approached you about learning how to knit, or you would like to teach someone how to knit, but you aren't sure how to begin, here are some tips that should help. Be patient and go slow. Knitting isn't easy for someone who has never done it before. Move slowly and don't get frustrated when you need to show your student something over and over. Get the person to relax. Knitting is intimidating at first, and approaching it with calm and relaxation makes life easier for everyone. Be encouraging and give compliments, even when the knitting doesn't look great. Consider knitting a couple of rows in advance as well as casting on to give the new knitter something to hold onto while learning. Some people like to start teaching knitting with the long-tail cast on because, once you understand that, the rest of basic knitting is easy. If you want to teach a cast-on method right away, a good choice would be the knitted cast on, because at least that teaches a new knitter how to make the knit stitch. Long-tail can be a little intimidating to new knitters and may get them started thinking knitting is hard. But the truth is a lot of new knitters cast on too tightly and might appreciate it if you cast on for them while they are trying to learn the basic stitches. You can always teach them to cast on after they've made their first little sample swatch. Don't ever use novelty yarns when teaching to knit or working on a first project. They make it too difficult to see the stitches. The very first project for any beginning knitter should be a swatch of about 20 or 25 stitches. The knit stitch should be practiced back and forth until the knitter is comfortable, then switch to purling. Remember to count the number of stitches you have at the end of each row, and tink if necessary to get rid of inadvertent holes. When your protégé is comfortable with those two stitches and is forming the stitches relatively evenly, you can teach binding off and move on to a real project. A garter stitch project such as a scarf or washcloth is a good choice for a first project because there's no pattern to remember. Even alternating knits and purls can be too much for some new knitters. Once a project has successfully been completed in garter stitch, purls can be thrown in. Again, something easy, flat and small like a washcloth is a great idea. Keep the first lesson under an hour, especially if trying to teach kids. Try to work in a quiet spot with minimal interruptions and good lighting. Sit beside the person you are teaching so you can easily see what's going on and help.